When growing up, this is one of the most common things that siblings will argue about; what is it? When growing up, one of the most common arguments siblings will have will be who gets to ride shotgun or who sits where in a vehicle. Congratulations to Miles McCollum of Eaton, OH for being the first to correctly answer the Impossible Question! The average man will do this twice as often as the average woman every day; what is it? The average man will shake hands twice as often as the average woman every day. Congratulations to Katie Soloman of Lynn, IN for being the first to correctly answer the Impossible Question! This was voted one of the most hated things a boss or manager says; what is it? “Give 110%” is one of the most hated things a boss or manager says. “Think outside the box” and “Hammer it out” were also on the list. Nearly half of all online daters say doing this once is okay, but more than once and it becomes a turn-off; what is it? Nearly half of online daters say misspelling a word once is okay, but more than once it becomes a turn-off! Congratulations to Tami Degroat of Connersville, IN for being the first to correctly answer the Impossible Question! 12% of all people say that if their boyfriend or girlfriend did this it would be grounds for a break-up; what is it? 12% of all people agree that if their boyfriend or girlfriend forgot their birthday they would break up with them! 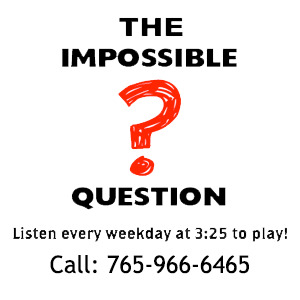 Congratulations to Dominick Sartain of Hagerstown, IN for being the first to correctly answer the Impossible Question! A little over half of all women admit that they have asked a stranger this; what is it? A little over half of all women have asked a stranger where they got their shoes! Congratulations to Lori Troutwine of Richmond for being the first to correctly answer the Impossible Question! 10% of all people admit that this has happened in a car; what is it? 10% of all people admit that they have went through a break-up in a car. Congratulations to Carol Morris of Richmond for being the first to correctly answer the Impossible Question! Over half of all women admit that they have done this inside a movie theater; what is it? Over half of all women admit that they have taken off their shoes while watching a movie inside of a theater. Congratulations to Matt Blymyer of Lima, OH for being the first to correctly answer the Impossible Question! 31% of all men will worry about this today; what is it? 31% of all men will worry about losing their hair today! Congratulations to Joyce Rust of Lewisburg, OH for being the first to correctly answer the Impossible Question! Ten years ago only 33% of all people said this was OK to do whereas today 81% of all people say it’s completely acceptable to do; what is it? Ten years ago only 33% of all people said that it was OK to use your phone while sitting on the toilet whereas today 81% of all people say it’s completely acceptable! Congratulations to Kathleen Elza of Richmond for being the first to correctly answer the Impossible Question! Almost one third of all people admit that one of the reasons they broke up with someone is because of this; what is it? Almost one third of all people admit that one of the reasons they broke up with someone is because they weren’t smart enough! 20% of all people say they would do this if they had more free time; what is it? 20% of all people say they would do more gardening if they had more free time! It takes the average person nine and a half minutes to do this; what is it? It takes the average person nine and a half minutes to find something to watch on Netflix! Single women that do this are three times more likely to get a date than single women that don’t do this; what is it? Single women that post a profile picture of them wearing a dress are three times more likely to get a date than single women that post a picture of them wearing something other than a dress! Congratulations to Kristin Wright of Richmond for being the first to correctly answer the Impossible Question! 71% of all adults have at least one stored away, some have three or more; what is it? 71% of all adults have at least one yearbook stored away, some have three or more! Congratulations to Mariah Miracle of Richmond for being the first to correctly answer the Impossible Question! Nearly half of all men have fallen asleep or nearly fallen asleep while doing this; what is it? Nearly half of all men have fallen asleep or nearly fallen asleep while getting their haircut! Congratulations to Kyle Miller of Richmond for being the first to correctly answer the Impossible Question! It was found in a recent study that over half of all people that come to the emergency room with this are intoxicated; what is it? It was found in a recent study that over half of all people that come to the emergency room with a snake bite are intoxicated; what is it?